Manufacturers using terms like Self Focusing binoculars, or as they also sometimes use: Auto Focus Binoculars is very misleading and leads to a lot of confusion. In this article, I hope to clear this all up. This is because these devices don't actually auto or self focus at all and there is no mechanism that automatically does this for you. This is just marketing companies hyping them up and in the process they have contributed to confusing everyone! More accurate marketing terms are fixed focus, focus free binoculars, or always in focus binoculars (but even then, you usually have a way of making minor adjustments to the focus as most of these instruments have a diopter adjustment on each of the eyepieces). These fixed focus or permanent focus binoculars that have no focusing mechanism in them at all and have been designed to have a fixed but really long depth of view (usually from around 40ft to infinity) and thus they are said to have a large hyperfocal distance. What this means is that everything from usually around 40 feet to infinity will remain in focus. However whilst you do get some permanently fixed focus binoculars with no focus mechanism at all, these completely no focus binoculars cannot allow for any sort of differences in the strength of vision between your eyes. So what are far more common and indeed far better are Individual Focus Binoculars. These don't have a single focus wheel and mechanism that simultaneously adjusts the focus on both sides of the binocular as you get on normal instruments and which most of you will be familiar with. Instead they have two diopter adjusters - one on each of the eyepieces that enable you to alter the focus of each side of the binocular independently. However this must not be looked at in the same way as the main focus wheel on a standard binocular. These dioptric correction rings are there to calibrate the binocular to your particular vision and thus allow for any differences in your left and right eyes. So whilst it is possible by using both the diopters to make small focal adjustments and thus change the minimal focal distance, they still don't have the same close range as you get on most cental focusing binoculars. How do "Auto Focus Binoculars" Work? In order to make a binocular that needs no main focus adjustment, they are designed to focus on distant objects with a very long depth of view. Thus their optics are designed so that they use your eyes natural ability to focus and so I suppose you can see where the marketing terms of auto focus or focus free came from. To set the fixed focus binocular to your particular eyesight, you adjust the diopter of each eyepiece to your vision (which is why they are also referred to as individual focus bins). Once you have completed this step, they require no further adjustments. That is unless someone with a different strength of eyesight wants to use them, your vision changes or your setting is moved by accident. Why all the confusion with the names? The confusion in the name and the tag of self focusing binoculars has probably been brought about by clever marketing strategies from the major manufacturers of this type of binocular trying to make them sound more sophisticated than they actually are. 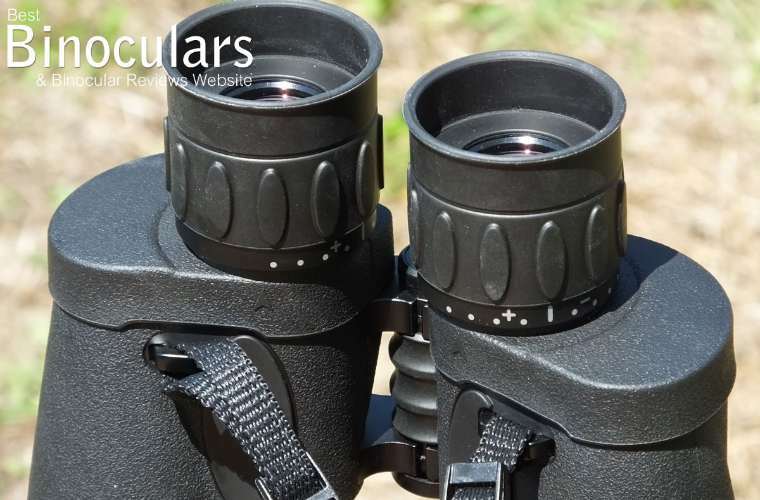 What ever you wish to call them, Fixed focus, or always in focus binoculars have been around for over a few decades now they have their uses and there are some excellent quality binoculars of this type out there. 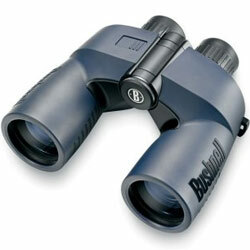 What are the Advantages Self Focusing Binoculars? The fewer amount of moving parts means they are much easier to make and therefore tend to be cheaper, more robust and therefore often much longer lasting. This also makes them much easier to make fully dust and waterproof. So as you can see a fixed focus pair of binoculars would be ideal for uses in harsh environments and so make popular military as well as marine binoculars. Less parts also means that they are oftem more lightweight than standard instruments. Because of the fact that once you have set the binoculars to your vision and no further focusing is necessary, it does make using them quicker than binoculars where you have to focus on every object you look at. This is perfect for fast moving erratic objects, so in theory they could make ideal birding binoculars, so long as a good close focus distance is not important to you (Fixed focus optics usually have minimum close focusing distance of around 35 - 40ft). The lack of a focussing wheel make the binoculars much less complicated and therefore are a lot easier to use, which is great for kids, elderly people and if you are wearing thick gloves for example. So once again ideally suited for cold or harsh environments and make ideal Skiing Binoculars and again ideal for marine use in colder climates. Focus free binoculars tend to have a good deep field of view. Should you have one eye that is significantly weaker than the other, these may be a good option because they usually have a big Dioptre Adjustment Range. For more on this take a look at this article: Individual Focus Binoculars or Single Diopter Adjustment? Always in Focus Binoculars sound great, but are considered to be a compromise in design, suited for convenience, but not well suited for work that falls outside their designed range or uses. Auto focus binoculars (fixed focus) do not usually have a very close range and many will only focus from about 35 to 40 feet and that is why they tend to be more popular for use in wide open areas like the ocean so are ideal for Marine Binoculars and would not be suitable where a close minimum focusing distance is important - Butterfly Binoculars for example. Fixed focus binoculars rely on the flexibility of your eyes to keep the image clear and in focus. This is not a problem for children and young adults, but as you get older the eye slowly loses its ability to focus and so for many people over the age of about 40, these binoculars could produce a lot of eye strain. Self focussing binoculars do have their place and uses, but because you set them to you individual vision, they are less suitable for sharing with others (unless you have the same vision) So don't take them to share with someone else at a sporting event or safari holiday for example. I recently received a question from a reader wanting to know "Does it make any difference if the binocular you want has individual eye adjusters or not, and which are better central focus knob, or individual eye focusers?" I think it is more a case of horses for courses in that both have their advantages over each other and thus which is better will largly depend on what situation you are in or what you are using them for. For uses like astronomy, marine, some sporting event or just about any long distance observation uses where you don't need a close focus and most of what you look at is far away, you do not need to constantly change focus and thus, once you have set up the binocular using the diopters on each eyepiece, you then never have to make any further changes. So here an individual eye focus binocular is certainly a viable option. For most other general uses and activities such as birding, wildlife observation etc, where you need the flexibility of being able to quickly take the focus from viewing something like a bird in a nearby bush to then viewing distant objects like a deer in a field or even the stars, then I would suggest a binocular with a central focus mechanism would be a far better option. Automatic Focusing Binoculars were initially made popular by the brand "Jason" which was established in 1947 in Kansas City. The Jason brand made a group of self-focusing binoculars that became very popular in the 1970's and early 80's. The Jason brand of binoculars was then bought by Bushnell who have now re-branded them as their PermaFocus line of auto focus binoculars. As far as I know, Jason Binoculars are no longer in production.